I HAVE SOME 8,000 ACRES THAT WE RUN AIRBOATS ON IN SOUTH LOUISIANA. PRIVATE PROPERTY AND AT THE END OF DEER SEASON WE GO IN AND TRY TO ELIMATE AS MANY PIGS AS POSSIBLE. WE USUALLY FILM FOR THE LOUISIANA SPORTSMAN SHOW. 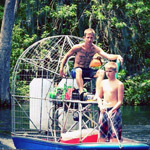 I'M LOOKING FOR A COUPLE MORE AIRBOATS FOR THE HUNT IN FEBRUARY OF 2015. JUST PLANNING AHEAD TO MAKE SURE I HAVE EVERYTHING COVERED. SMALL NOTE, PROPERTY IS STUMPY AND YOU NEED A LOT OF HORSE POWER. EACH AIRBOAT WILL HAVE A CAMERA MAN IN IT. IF INTERESTED JUST HIT ME UP ON HERE. MANY THANKS IN ADVANCE. Well all I can say is that looks like fun BIG TIME! That looks like an accident waiting to happen..... count me in! I think my barge can navigate that! NOW THAT'S MY KIND OF PARTY !!!! but my mini would never hang on that terrain!!!!! What the hell is pig hunting? I have been hog hunting a few times but never pig hunting lmao. Must be an up north thing! Bubba wrote: What the hell is pig hunting? I have been hog hunting a few times but never pig hunting lmao. Must be an up north thing! No doubt. My favorite is wild boar hunting lmao. I'll just send my 9 yr old lil girl she's knows how to hunt "wild boar"
Be carefull Pete, someone will bring their trained poodle over their trail him up in the yard and claim they got a jam up hog dog. Ps it will be for sale for a grand shortly afterwards lmao. If you would quit feeding that thing popsicles he wouldnt be so dang viscous. LOL. If you still need boat I would definitely be intrested. Nothin better than runnin them pigs with the airboat!! What area? You can probably count me in if you still need boats. It be a long hull from South florida....But I'd love to come out to duck hunt. Please send me info , would love to participate ! Where are you going to get the time to do it a second time? My son took this one last Saturday; no gun, just two dogs and a knife.